This lovely country house has two double bedrooms, one bathroom, a spacious kitchen and a dining room, is ready to move in and seats in a lovely spot with mostly flat land bordered by a river stream. On entering the house through the entrance hall, gives you access to a dining room on the right, bathroom on the left leading on to 2 double bedrooms and at the front is the kitchen, the entire house flooring is tiled, the windows are single glazed aluminum with sun shutters. Both of the house’s bedrooms are big enough to have double beds and are both nice and light. The family bathroom is fully tiled, very spacious and could accommodate a bath tub if required. The kitchen is open plan and includes an open fire place with a back boiler. There’s enough space for a dining table. There is a BBQ area at the back, the annex is also well built with a good roof and has it’s own shower. The garden is large enough and has various established fruit trees. The house has mains water but its own water source too. Electricity and telephone are already connected. The location offers the best of both worlds; a small peaceful village, Ribeira Velha, in a stunning valley surrounded by places of natural beauty such as natural river pools, historical Roman settlements and bordered by numerous natural hiking tracks with great scenery spots provided by the mountain top and forest land in Central Portugal. This property is an excellent opportunity for somebody who is looking for a peaceful but accessible location in this wonderful, undiscovered part of Portugal. It is the practical option of comfortable house to live in on a holiday or year round basis; but still with the development potential to make it your own. 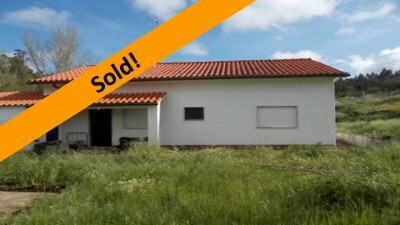 The property is situated in a rural location on the edge of the village “Barqueiro”, though is not isolated. The bigger town of Maçãs Dona Maria which has a range of amenities including market, banks, cafes, restaurants, medical centre, post office, pharmacy and shops is less than 10 min drive away, the bigger Municipality of Alvaiázere which in addition to the above also offers further local services and sport facilities such as a Police station, Hospital, Registry office, Tax office, Court room, Indoor and Outdoor swimming pools, full size football pitch, athletics running track is also less than 10 minutes drive. The historic town of Tomar, which is home to the UNESCO listed Convento do Cristo, founded by the Templar’s crusaders is only 30 to 35 minutes drive from the property. All major European high street shopping is also available in the city of Coimbra the 3rd biggest city in Portugal which is only 45 to 50 minutes drive on the A13 motorway. There are also very good access roads to the IC8 dual carriageway, which leads to the coastal towns of Figueira da Foz and can be reached by car in approximately 1hour.